Let’s Make a Stufz™ Burger! 1. Pull Stufz™ handle straight up until it clicks and twist slightly clockwise. Handle should be resting in the holder (Figure 1). Pull side latch slightly until top releases and opens fully. 2. Place ball of meat into Stufz™. Use a Heaping 1/3 cup (approx. 5 oz for max burger, or less to fit your appetite. 3. Close the lid and latch to lock. Make sure the handle is still twisted clockwise as in Figure 1. Push handle down firmly to flatten ball of meat. 4. Pull handle up and turn counter-clockwise until it stops. Press handle down multiple times to form pocket/ cavity (FIGURE 2). 5. Pull handle up slowly, unlatch lid and lift completely to see your pocket/ cavity (FIGURE 3). If pocket is not deep enough add a little more meat and repeat step 4. 6. 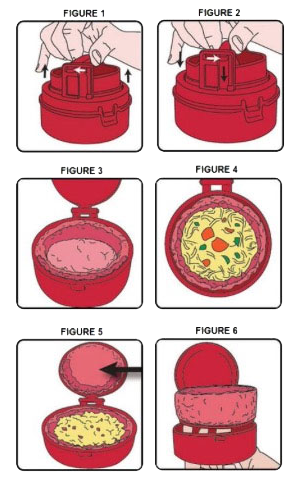 Fill cavity with your favorite toppings (FIGURE 4). (FORMED MEAT SHOULD NOT BE ABOVE RIM ON BASE) IMPORTANT: Raw ingredients should be fully cooked before stuffing into burger. 7. Return the handle to the position as in figure 1. Add ground meat to the inside of the top and spread out evenly to fill entire shape (FIGURE 5). 8.Close and latch the top, press handle down firmly while rocking it to seal burger top to burger bottom. 9. Open Stufz™ and press disc up from meat (FIGURE 6). Always remove your stuffed burger from the Stufz™ before cooking. 10. You are ready to cook your burger!